One of New York’s Top Pizza Pros Has a New Slice ShopWilliamsburg Pizza’s Nino Coniglio is serving L&B-style squares, Sfincione Sicilians, and classic slices. Here’s Wonderful News for People Who Can Jog and Eat Pizza at the SameThis is how hipsters do triathlons. Is This New York’s Smelliest Pizza?The guys at Williamsburg Pizza certainly hope so. 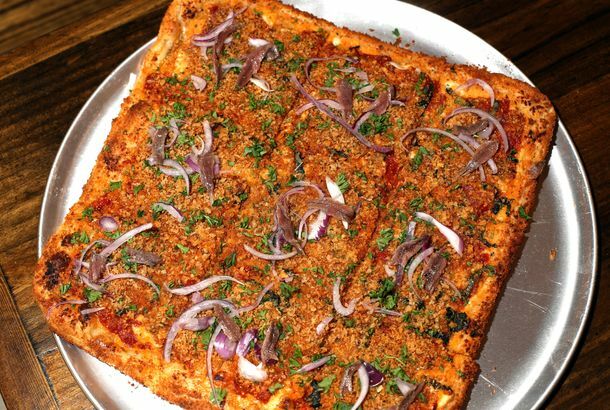 Danny Brown Drinks Celebrity Booze; Williamsburg Pizza Opens LES LocationPlus: drinking in bookstores and more brisket than you can shake a stick at, in today’s leftovers. Williamsburg Pizza Coming to Lower East SideThe Hotel Chantelle owners are involved. Williamsburg Pizza Will Open Tonight With (of Course) a Visit From MartyThe borough prez rarely misses a chance to grab some food.